September's platform distribution numbers for Android are now available, and... they're dully predictable. Marshmallow's growth returned to the levels we saw in July, gaining 3.5 points versus its position a month ago. Lollipop has returned to a net decline, with v5.0 losing a full point of the pie and 5.1's half-point increase not being able to make up for it. 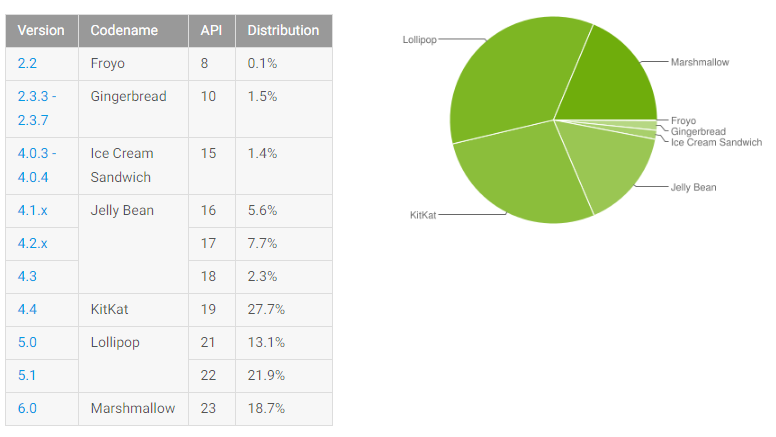 That means Lollipop, combined, is on 35% of all Android devices Google counted versus Marshmallow's 18.7%. KitKat dropped 1.5 points, Jelly Bean (all versions) collectively dipped a meager 1.1 points, and Ice Cream Sandwich and Gingerbread barely budged from their previous positions. Froyo clings on at 0.1%, taunting us. Nougat isn't yet on the chart, which makes sense. Even though the data was collected around two weeks after the Android 7.0 OTA hit Nexus devices, the Nexus 6P's OTA was pulled shortly after release, and the Nexus 6's Nougat build has not yet been pushed at all. That means most of the two most popular Nexus devices that are eligible for the update still don't have it. So, we'll probably see a nub of nougat sticking out of this pie come October.